Where to go and what to do in Santorini 2019. 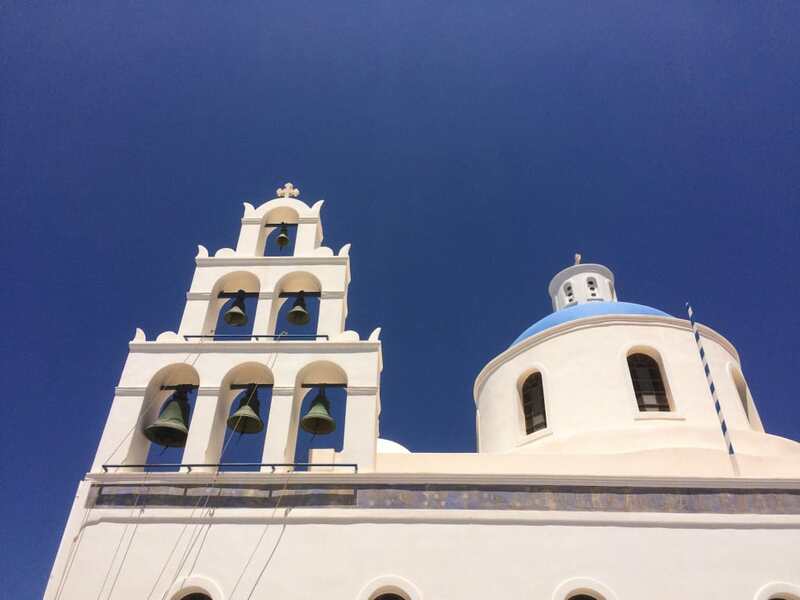 Travel to Santorini – Reminiscing about my short trip to Santorini. A few days sunshine, blue skies and crystal clear water would be great, right now! However, every year it gets more and more popular. Cruise ships stop off every day and fill the island with day trippers. To be honest four days was enough time to spend on such a small island. Ideal for a short break or island hopping, it is easy to understand why my yacht owning friends enjoy a summer trip island hopping. My advice is to stay on a few different islands rather than just one. 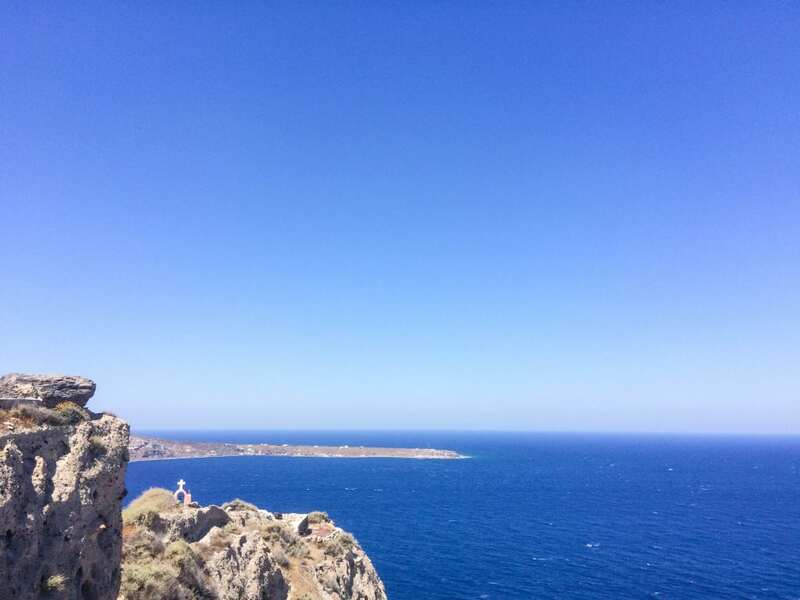 I stayed in the quiet, Southern part of the island, Akrotiri was the nearest town, on the coast facing Thera and Oia, which are the white blobs on my photo below. 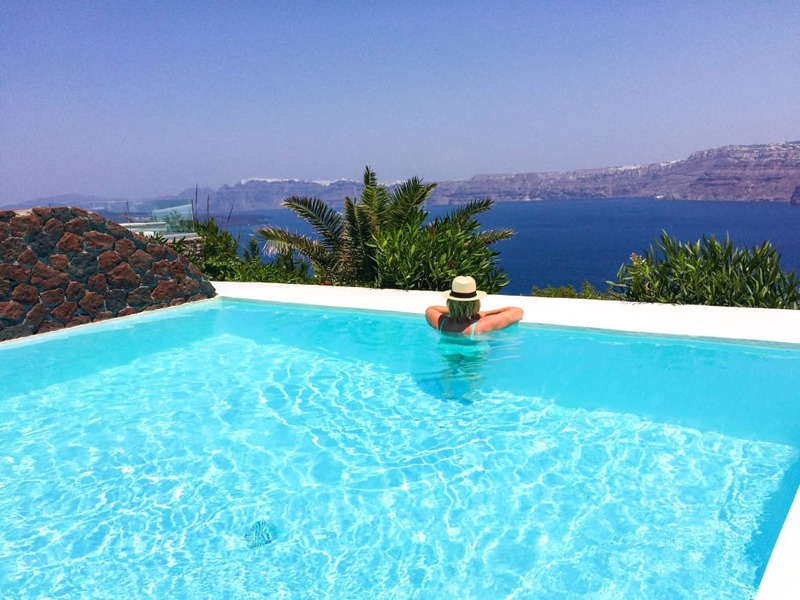 This is the undiscovered jewel in Santorini. Most people do not venture much further than Oia. Weather: Obviously hot …… and crowded in high summer. If you have the chance then go in Spring or Autumn. The island gets packed with cruise ship day trippers in summer. They are only ashore for a few hours so if you are there in high season then explore early or late in the day and avoid the crowds. The North is by far the nicest part of the island, away from the tourist hub of Thera. The sunsets in this part of the island are spectacular and every evening there would be quad bikes making there way to watch the sunset. I stayed in a boutique hotel, in a villa with private pool. I’m not going to recommend this Hotel because it was very, very expensive and not really worth the money. Admittedly, this was in June and tourist season, but even so …. Santorini in general is very overpriced. Hire a Quad bike to get around the island. Go to the North to watch the sunset. Hire a boat for a day. Go to Oia in the evening when the day trippers have left the island. 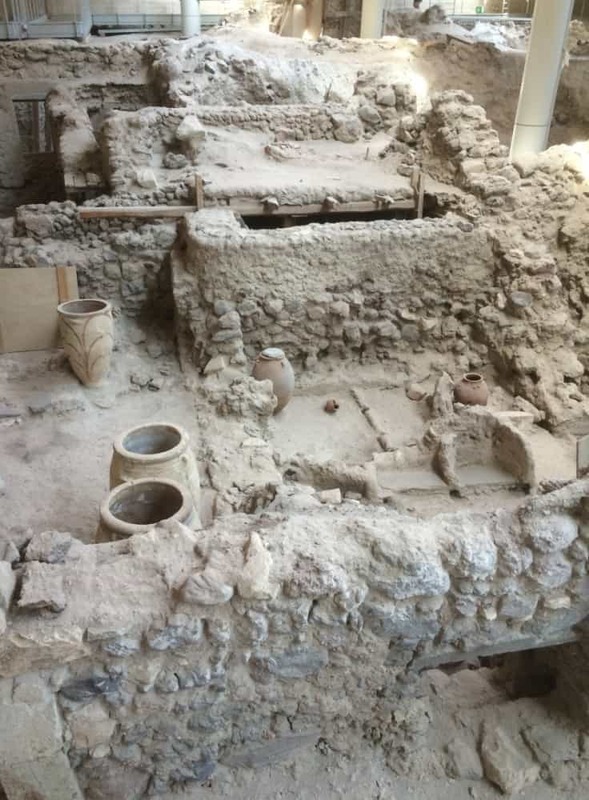 One of the highlights was visiting Akrotiri and the archaelogical site, the most important Minoan site outside Crete. Santorini is one of the Cycades Islands hit by volcanic eruption with dreadful consequences for the people of the island. Akrotiri has charming little coves, beaches and restaurants. If I visit another time I wouldn’t bother going to Thera – except for the iconic photographic opportunities! I hated the crowds of cruise trip visitors filling up the streets, go early or late in the season and it is probably very different. However, if you enjoy a buzzing nightlife, this is the place for you! 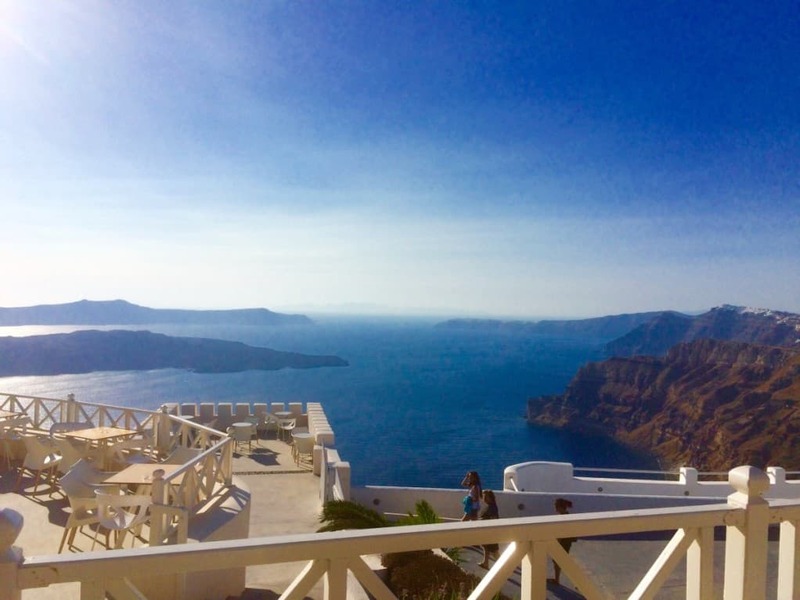 Oia – would be lovely without the cruise trippers. I read recently that plans are in place to limit the numbers, which is an excellent idea. It is a picture perfect, idyllic white village clinging to the hillside. Definitely visit but only stay if you enjoy crowds and hustle and bustle. Northern Santorini – I shot this in the far North, just stunning isn’t it? The blue skies and sea are unbeatable. Wine tasting – You must visit some of the vineyards and sample some of the local and surprisingly good wines. Wine growing started in Roman times in Santorini and the vines are still grown in the same style, allowed to trail on the ground with the leaves covering the precious grapes. I discovered santo winery, Pirgos whilst driving back to Akrotiri. What a delightful place, probably the best view of any winery I have every visited – and I have visited many wineries! 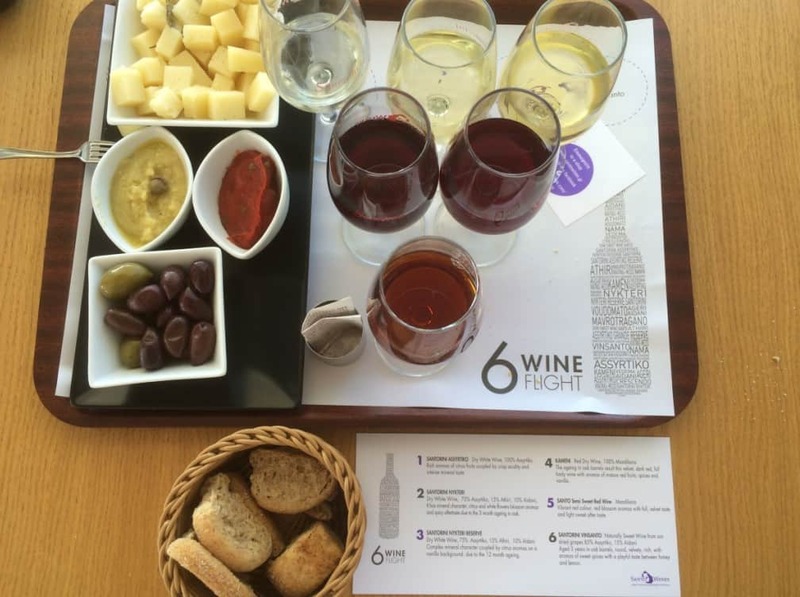 http://www.santowines.gr A little wine tasting with cheese, looking at the stunning view above – not a bad way to pass the afternoon! This reminds me, I bought a pack of local FAVA beans here – still wondering what I am supposed to do with them! Yes, that is 6 glasses of wine you can see on the tasting tray! The Santorini sunsets are magical and you will see scores of quad bikes heading up to Akrotiri to catch the best sunset. Everyone gets about on Quadbikes here and they are great fun! Definitely take a boat trip to other islands or just simply cruise around the island visiting little coves. Santorini Airport is horrendous in high season, I mean really disorganised and crowded. Readers have told me of their horror at the airport conditions. I must say, it is not good for a European airport! I recommend heading up to the roof after check in, this is the best spot to avoid the Sardine in a tin conditions! You can admire the view and might actually grab a seat. Be aware, there isn’t a Club Class lounge – British Airways really need to do something about this, and soon! However, it is very convenient having a British Airways flight out of London City Airport. 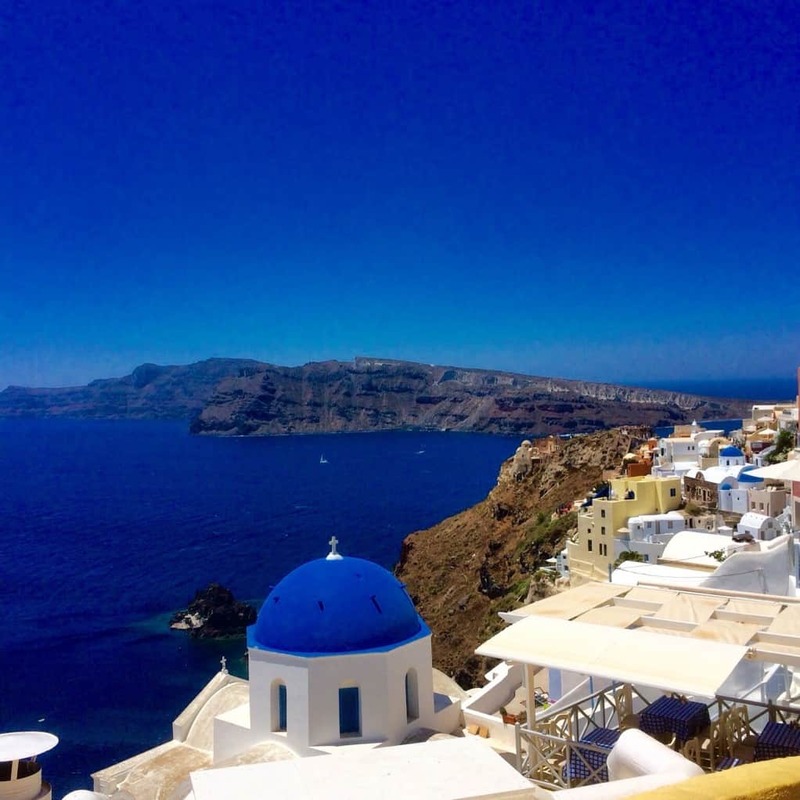 Travel to Santorini would be much nicer early or late in the season. Cooler and less crowded. Try and avoid August! Where to go and what to do in 2019. The island is expensive! Too many people and too few places to stay = expensive! Try and stay outside high season, rent an Airbnb or a villa and avoid those overpriced Boutique hotels! We hired a car, which is the best option. You can hire a Quad bike, which is a popular option, see link below. Island hopping is the most fun in the Greek islands. Take a ferry to nearby Crete for a few days or day trips to other local islands. Visit Oia and Thera but don’t stay there unless you like noisy crowds. Wine tasting. The only vines grown in the world in the same way that Romans grew Grape vines 2000 years ago! Delicious wine too… take some home. Northern Santorini and Akrotiri. Fascinating and highly recommended. Gorgeous little waterside tavernas here too. Hire a boat. The best way to explore by far! We booked a British Airways flight from London Airport.